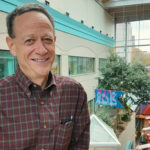 In addition to being the Director of the Canadian Center for Vaccinology (CCfV) in Halifax, NS, Dr. Halperin is a Professor of Pediatrics and Microbiology and Immunology at Dalhousie University, and the Head of Pediatric Infectious Diseases at the IWK Health Centre in Halifax. He is also the Co-PI for the Immunization Monitoring Program, Active (IMPACT) and a member of CAIRE’s Management Committee. His research focuses on the diagnosis, treatment, and prevention of pertussis and other vaccine-preventable diseases.